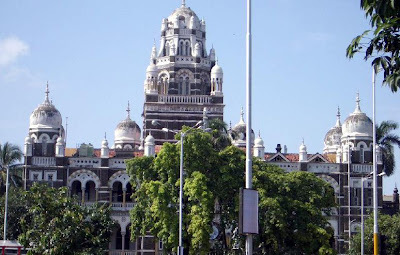 The Western Railway Headquarters in Mumbai, was built by the British in a new architectural style called Indo-Saracenic, which incorporated traditional Indian design elements like domes, brackets, and arches, in modern architecure of the colonial era. Many buildings in Mumbai are built in this Indo-Saracenic style, but in a seminal held at the K R Cama Oriental Institute recently, scholars and historians traced back the architectural background of Mumbai to more than 2000 years! According to a paper by Anita Rane Kothare, head of department of ancient Indian culture at St Xavier’s College, Magathane near Borivali has water tanks built for the benefit of Buddhsit pilgrims traveling to nearby Kanheri and Kondivite caves for worship and meditation. Then after a long gap we have Shaiva temples like Babulnath and Walkeshwar, built in the 18th century. Before that the Portuguese had possession of the island of Bombay and there are a few churches and bungalows built in their style of architecture. A distinct feature of these Indo-Portuguese houses was the ‘Balcao’ - kind of portico with seats built into it. With the British Raj Mumbai's heritage was enriched with buildings like Sir J J School of Art, Bhau Daji Lad museum, Bombay High Court, Secretariat, David Sassoon Library, Bombay University, GPO, Chhatrapati Shivaji Vastusangrahalaya (formerly Prince of Wales museum), Gateway of India, Times of India building, and Majestic Hotel (MLA hostel). In many of these buildings the Indo-Saracenic style gave way to a modern art deco, incorporating modern design elements of the 20th century.